Ketchup has come a long way from its Chinese (koe-chiap or tchup) origins as a salted and fermented fish sauce – a thin liquid more like soy sauce. When it eventually found its way to the US and Europe via Asia, it was adapted to suit the local palate and ingredient availability. Variations have included mushroom or walnut sauces and, of course, Worcester sauce. Later, the addition of tomatoes produced a much thicker liquid – because of the tomatoe’s natural pectin – known as tomato soy. The fermentation cycle was removed to suit the faster manufacturing methods pioneered by the market leading producer. Vinegar and sugar were added, plus starch, to produce the sweet and sour condiment now known to everyone in Europe and the United States as tomato ketchup. Tomato ketchup has been around for a long time but here at KaTech we believe there’s always room for improvement! 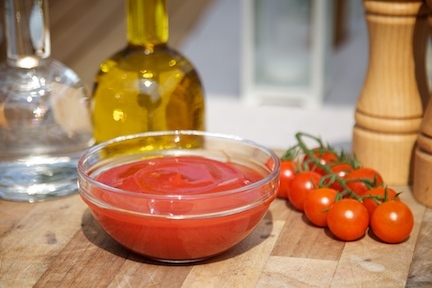 We can work with you to develop tomato ketchup recipes which will have all the characteristics your retail customers, and consumers, are looking for. Ketchup is usually made using just over one third tomato solids – generally made with tomato puree. Manufacturers face the choice of using hot break or cold break tomato puree. Hot break is thicker due to the thermal destruction of natural pectinases allowing survival of the natural pectin released by the heating process- but it is more expensive than cold break. Cold break tomato puree, on the other hand, is more flavoursome since it contains more of the volatiles but also retains the pectinases which survive the lower heating temperatures and degrade the natural pectins. However, pectin or other hydrocolloids can be added back into the ketchup as long as the product is to be heated above 95OC centigrade to destroy the natural enzymes. Another area of innovation is in flavour development. It is sometimes difficult to draw the line between ketchups and chutneys since mushroom, banana, mango, and even cherry ketchups can be made. Generally they are smoother than chutneys with no chunky pieces of vegetable. Talk to our technical team today about your ideas for ketchup innovation – and how we can help make them a reality. Although a fairly straightforward recipe, making ketchup can result in some problems. Syneresis (liquid exuding from the gel) can be a problem, with a watery layer sometimes sitting on the top of the bottle. This can be the first thing which is seen on pouring. In our experience this is often caused by too much gelation and water being squeezed out of the matrix. Our technical team will be happy to discuss with you how this and other issues can be avoided. The food technicians at KaTech can cost optimise your ketchup recipe – helping you produce a great product for less. Tomato ketchup is composed of expensive tomato puree which makes up the bulk of the recipe’s solids element. This pulpy texture can be duplicated by the use of food gels. This allows you to replace some of the puree with no loss in flavour or colour. Talk to us today to start making cost savings on your recipe.